Check out this bedroom! There are two things that call my attention on this photo. 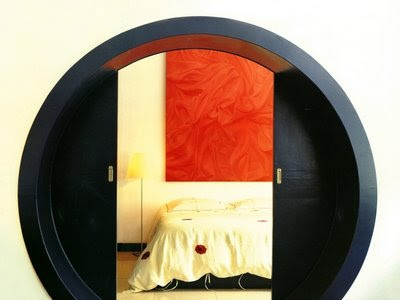 First are the unusual doors that, as for me, associate with a ship, specificaly with the round windows that ships have. Second is the classic combination of black and red. It's exactly the case when black does't mean dark. These colours look modern at all times, and they are certenly nice for a bedroom. It's hard to disagree that they are the colors of romance and passion.